Limited to SIX persons only– so don’t delay, book today! At the same time of year, the elephants of Mfuwe return to the lodge for the very same reason, to feed on the succulent fruit trees around the lodge. The matriarch of this particular family of elephants, now known as Wonky Tusk, has been bringing her family to the lodge for over 20 years. Her children, including Wellington, feel at ease when visiting the lodge. So much so that they enter the lodge in the same way as other visitors, through the main lobby! And one other visitor arrives in Northern Zambia during this time of the year. The African pitta is a radiantly colored bird, also known as the Jewel Thrush, or the Jewel of the Forest. This unique safari takes you to see these three iconic world events, along with a chance to experience another of Zambia’s special offerings, the walking safari. Pioneered in Zambia, the walking safari allows a party of six, each day, to walk under the guidance of a professional safari guide. This is not a strenuous hike, but a leisurely walk amongst the wildlife of the Luangwa National Park. Imagine walking in the shoes of early explorers like David Livingstone and more recently Teddy Roosevelt on their visits to Africa. Don’t miss this chance to experience, on one safari, these four very special and world renowned events. Only six places are reserved on this safari. Make your reservation today so not to be disappointed. Jim Holden, whose family has lived in Africa for four generations, is leading this safari back to his homeland. Able to converse in the local language, join Jim to experience an extra dimension to this very special safari, by getting an in-depth perspective of life in Zambia. At Lusaka International Airport you will be met by a representative from Tours Africa who will assist you with luggage and check-in for your private charter flight to Kasanka (Mulembo airstrip). Upon arrival at Mulembo a representative from Wasa Lodge will meet and transfer you to the Lodge approximately five minutes away. Tonight you will have the opportunity to visit the bats of Kasanka. 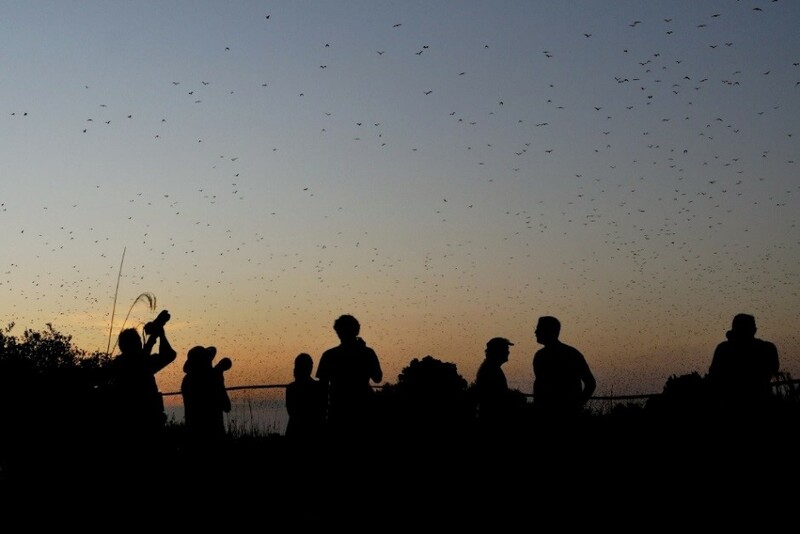 The bats leave their roost in the evening and return early in the morning allowing for some stunning views of a blackened sky with either the sun-set or the sun-rise as a back-drop. There are several tree-top hides set up around the edges of this patch of forest enabling you to get up close to this incredible spectacle. You are there during the full moon. A photographers dream! View the world’s largest mammal migration, where millions of bats with three foot wingspans, come to feed on the fruit trees at Kasanka. The lodge is also home to the elusive Sitatunga antelope, seldom seen due to its adaptation to spending most of its time in water. Kasanka offers a unique opportunity to observe these animals in their natural habitat. Visit the memorial to Dr David Livingstone, explorer and missionary, whose life ended at nearby Chief Chitambo’s village in his quest to find the source of the Nile. Hear the story of Livingstone’s faithful servants, Susi and Chuma, who embalmed his body and carried it over 1000 miles on foot to Zanzibar to be carried on by ship to England. Livingstone was given a hero’s burial in Westminster Cathedral in London, admired throughout the British Empire for his devotion to bringing Christianity and commerce to Africa. This morning, take a Charter flight to the neighboring Luangwa National Park to Zungulila Bushcamp. 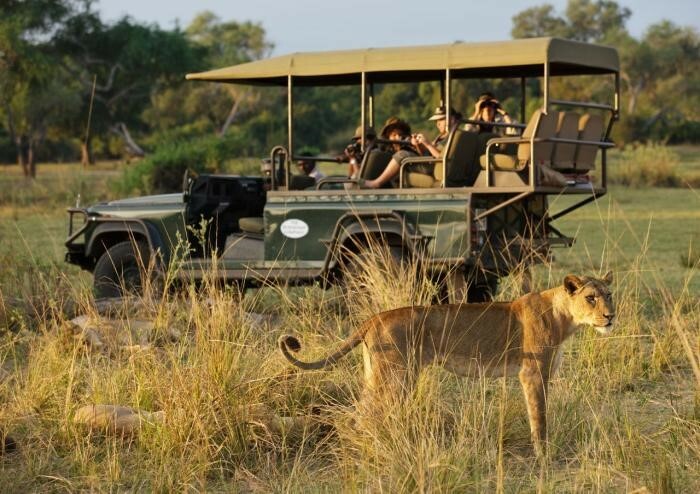 Here you will experience one of Zambia’s unique wildlife walks in the care of a professional safari guide. These walks were pioneered in Zambia allowing only six safari goers to accompany each guide. On a safari walk, all of one’s five senses come alive! As they say at Mfuwe, “From a vehicle you see Africa. On foot you feel, hear and smell Africa.” You could add touch and taste as your guide draws your attention to everything around you, including the trees and vegetation, as well as the wildlife, both big and small. 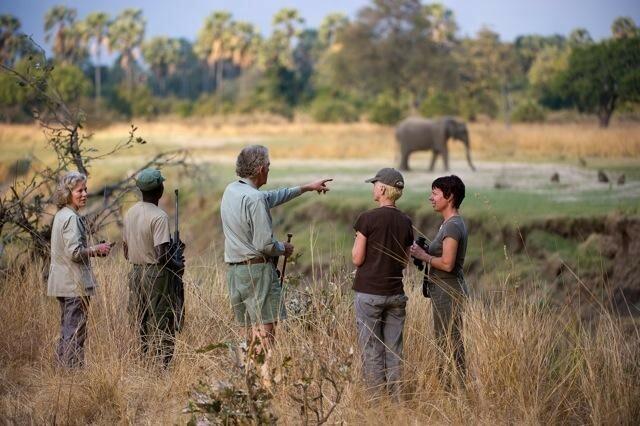 The South Luangwa has earned a reputation as one of the best places to conduct walking safaris in all of Africa! We venture out once more with our professional safari guide not knowing what adventures await us! Your visit to the South Luangwa in November has been timed in order to maximize your game-viewing opportunities. It is unlikely that any rain will have fallen in the area for the past 6 months, the rivers and lagoons will be drying up and the animals will need to congregate close to whatever water they can find. Not only does this make it easy to see the great diversity of fauna on offer in the Luangwa but it makes for slightly easier hunting for the large numbers of predators that call this Park their home. 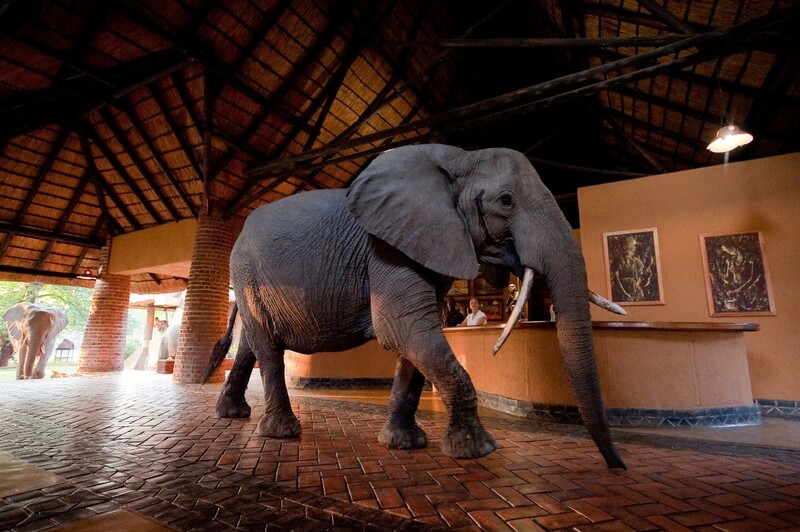 Today a morning game drive takes you to the Mfuwe lodge, at the entrance to the Luangwa National Park. Here you will see the visiting wild elephants arriving to feed on the fruit of the Wild Mango Trees at the lodge. Wonky Tusk and her family will enthrall you with their antics, entering and leaving the lodge walking right through reception to reach the fruit of the trees. The regularity and reliability of this parade has meant that this particular family of elephants has become known the world over, documentary film-makers and regular guests alike are enthralled by their antics. We will have ample opportunity for close up photography. In the morning take a game drive to view wildlife. It might be possible to spot Wonky Tusk and her family returning to the lodge for more of the fruit. Venture out again in the afternoon by jeep. With the help of the trained eye of your professional safari guide you might see wild dogs, once close to extinction but now happily becoming more common. Tonight enjoy a farewell dinner before you prepare to start your journey home the following day. This morning after breakfast you will be transferred to the Mfuwe Airport to take a scheduled flight back to Lusaka where you will connect with your international flight home. Bid a fond farewell to the bats of Kisanka, Wonky tusk and her family and the African Pitta bird. And of course to your professional safari guide and all the wonderful Zambian safari team who took such good care of us.